The sin­gle biggest risk asso­ci­at­ed with stor­age at high­er than the rec­om­mend­ed stor­age con­di­tions is a reduc­ing of flow rate. Epoxy mold­ing com­pounds when blend­ed already have the resin/hardener com­bi­na­tion into one blend — and this is what we call a “B-stage” mate­r­i­al. B-stage refers to a stage between the unmixed (A-stage) and the cured (C-stage) of the cur­ing cycle. In its B-stage, it is there­fore impor­tant to keep the mate­r­i­al refrig­er­at­ed to slow down the cur­ing process. The cold­er the mate­r­i­al is kept, the slow­er the process takes place. The most impor­tant rea­son to slow down this process is to be able to ensure that the mate­r­i­al can be processed at the cus­tomer loca­tion. If the mate­r­i­al is not kept under prop­er stor­age con­di­tions, the flow rate of the mate­r­i­al will decrease and there is a risk that the mate­r­i­al does not fill into the cav­i­ties of the mold prop­er­ly result­ing in a defect known as “incom­plete fill”. What is very impor­tant to note is that regard­less of the flow rate of the mate­r­i­al, for all intents and pur­pos­es the final prop­er­ties of the cured mate­r­i­al are unaf­fect­ed. This means that whether the flow rate is still at 100% of its ini­tial val­ue, or at 50%, if the mate­r­i­al is then post mold cured, the Tg, CTE, mois­ture resis­tance and all oth­er crit­i­cal prop­er­ties remain the same. This being said, “incom­plete fill” is also a defect, so the shelf-life of the mate­r­i­al is giv­en such that the epoxy mold com­pound is with­in the flow rate spec­i­fi­ca­tion right until the end of the shelf-life. The way we mea­sure this shelf life is to keep mate­ri­als stored at var­i­ous tem­per­a­tures and then we test the flow rate over a peri­od of many days to see the effect on the flow rate. As you can see in the attached chart for a “tem­per­a­ture sen­si­tive epoxy”, as expect­ed, the flow rate data drops dras­ti­cal­ly at room tem­per­a­ture (23C). 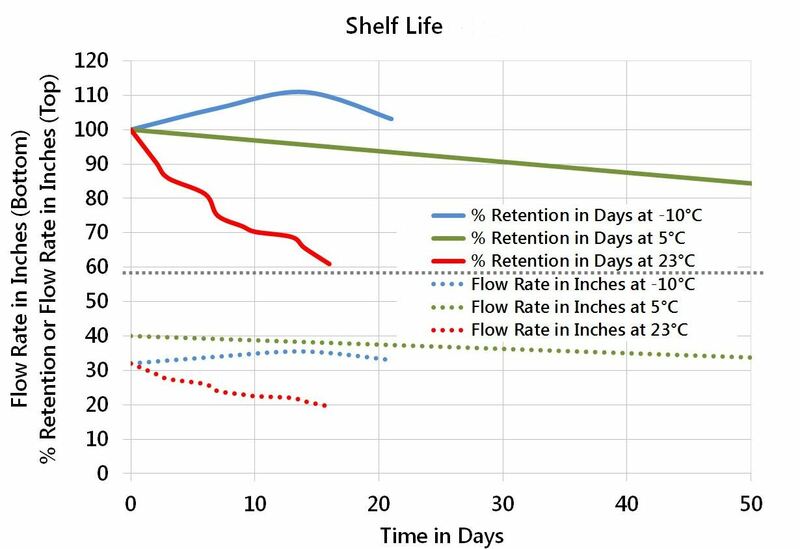 At 5C how­ev­er, we have a sig­nif­i­cant­ly improved shelf life — and have less than a 20% reduc­tion even after 50 days. At -10C stor­age, we appear to have almost no reac­tion tak­ing place, though we need more data to be able to com­ment more accu­rate­ly. Please vis­it us at www.caplinq.com to learn more about our whole range of epoxy mold com­pounds includ­ing our Trans­fer Mold Epoxy Com­pounds and Com­pres­sion Mold Epoxy Com­pounds. If you have any oth­er ques­tions about epoxy mold­ing com­pounds, please feel free to leave a com­ment below or don’t hes­i­tate to con­tact us. Environmental Philosophy + Sustainability = Green Chemistry!